DLF King’s Court– A rare collection of uber indulgent homes encrusted with the best that money can buy and subtle elegance that money just can’t. King’s Court is as exclusive as it gets. Flats of approx. 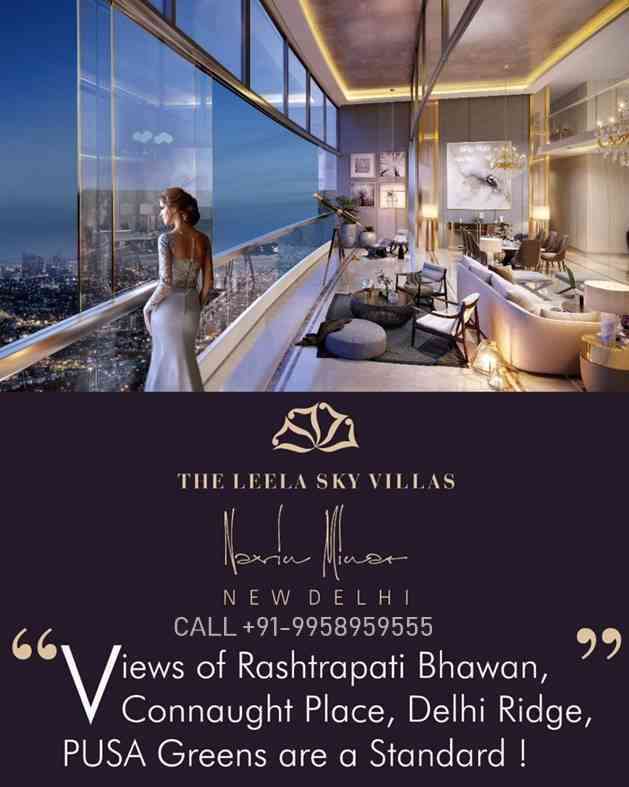 2300 to 10500 Sq Ft on one land are unprecedented in Delhi with concierge services & exclusive DLF privilege card membership. Needless to say, these are for the ‘Limited few’. Constructed By TRA Private Ltd.
4 Bhk Type-A01(2nd to 8th Floor) 5,442 Sq. Feet. 4 Bhk Type A02 2nd to 8th floor 5,442 Sq. Feet. 5 Bhk Type B & LIG Unit (2nd to 8th Floor) 7,251 Sq. Feet. The commercial terms and conditions mentioned above are prevailing and subject to change without prior notice. DLF Kings Court Greater Kailash II New Delhi – Where Luxury Is the Second Name Greater Kailash will be the address of lucky few who have chosen to invest and make Kings Court as their new address! DLF is offering limited flats for sale in Greater Kailash area. DLF has been active in realty market for more than decades. DLF presents Kings Court, a luxury residences comprising of centrally air conditioned 8 storied apartments and townhouses. There are 57 exclusive luxury apartments and townhouses range from 5000 sq. ft. to 7000 sq. ft. spread over 2.46 acres of land. If you love to be in the company of nature, then this residence is perfect for you. 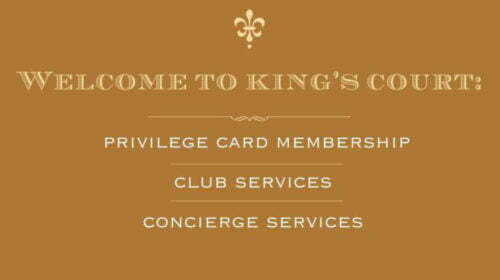 Kings Court is a gated community and secured with 3 tier security system, so that you can sleep in peace at nights. There are dedicated parking slots for every resident and separate marked parking surface for visitors. DLF is offered 3, 4 and 5 BHK apartments for sale with sizes ranging from 2400sq. ft. to 7253 sq. ft. The amenities are offered keeping in mind the convenience and safety of the owners. Apart from gated community, there are high speed elevators for apartments and townhouses, 24 hour power back up, spacious entrance lobby and visitor area, piped natural gas connection in every home, a fully equipped gymnasium, a reading lounge, swimming pool and a multi-purpose hall inside the community to make your every event memorable. Maintenance services are managed by a professional maintenance agency. All flat and townhouses are semi furnished with modular kitchens and appliances along with modular wardrobes. The construction has already started and will be ready for possession in next two years. Located in heart of Greater Kailash II, W-block, Kings Court has breath taking view of 600 acres of Jahanpanah Gardens on one side and surrounded by large park on the other side. It has a good connectivity to the Greater Kailash M Block market. 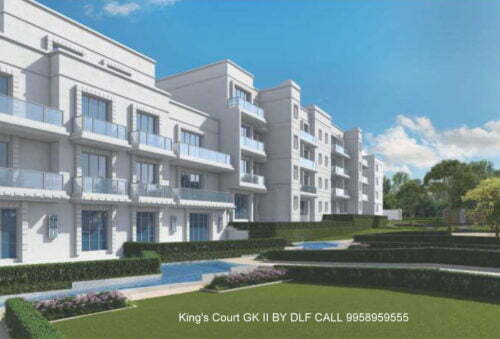 DLF Kings Court has an edge over other properties as it is a fully approved freehold property. 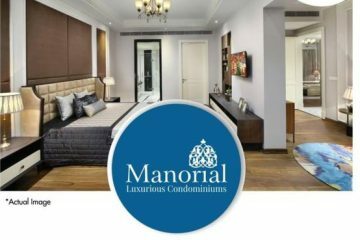 All the houses and townhouses are designed by reputed architect Hafeez Contractor and handcrafted with love with utmost care for security and luxury. DLF offers construction linked payment plan. Alameda-Gurgaon, DLF Riverside-Kochi, Commanders Court-Chennai, Garden City – Indore and many such projects. When DLF is associated with any project, luxury is very important to them. They give world class sense of feeling to any of their projects. 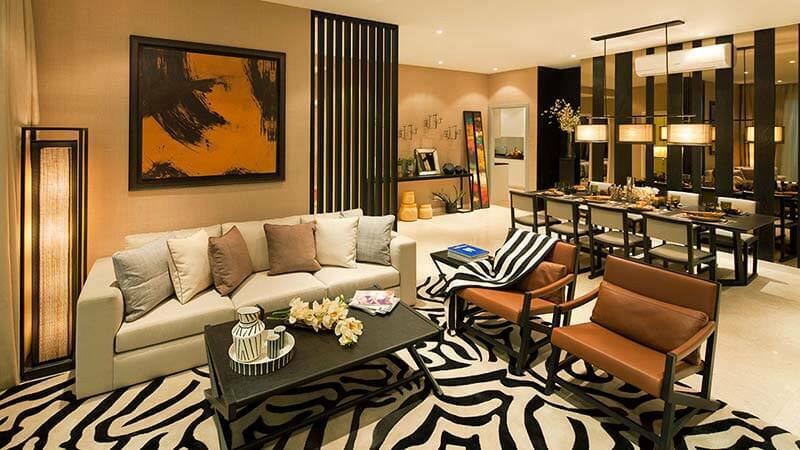 All DLF projects are well maintained, luxurious and a masterpiece in itself. DLF has been winning several awards over the year like ‘Best Shopping Mall of the Year’, ‘Asia Responsible Entrepreneurship Awards’, Pt. Madan Mohan Malviya Award for best CSR Practice in Education, among others. Come; soak yourself in the simplicity of nature. Kings Court gives your apartment the sense the style along with class and luxury. When your money is at stake, then DLF has to be the only choice. Hurry, few apartments are only offered. Do not miss this opportunity at any cost! 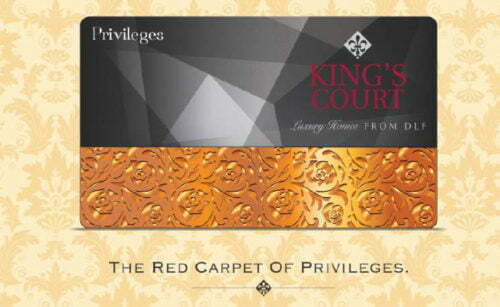 DLF presents King’s Court, the most iconic property this city has ever seen. Crafted in the heart of New Delhi, GK-II, W-block, King’s Court is as exclusive as it gets. Architect Hafeez Contractor:Gated Community with 3-Tier Security Systems:Centrally Air-conditioned Apartments / Town Houses of 5000 sq.ft./7000 sq.ft. :verlooking the scenic Jahanpanah forest on one side and flanked by a large park of around 8 acres on the other. Perfect for those who like to be close to nature:Integrated complex – Apartments and Town Houses separated by Maintained Greens inside and surrounded by Jahanpanah Gardens, “W” Block MCD Park and the Block Market. King’s Court is an embodiment of you and the way you think:modern, forward-looking and conscientious. King’s Court is just such a home.One which goes beyond the tangible to offer you the intangible luxury of living in complete harmony with nature, and one step closer to the future. There are those, who everyone asks about and then there are those who need no introduction. This is for the latter. 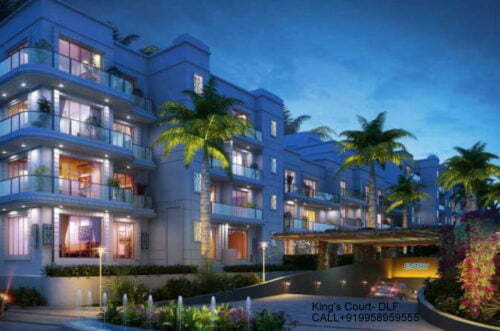 DLF presents King’s Court, the most iconic property this city has ever seen. Crafted in the heart of New Delhi, GK-II, W-block, King’s Court is as exclusive as it gets. For there are only a limited number of homes on offer. Encrusted with the best in class luxury money can buy, along with the subtle elegance that money just can’t. Needless to say, these are for the ‘Limited few’. 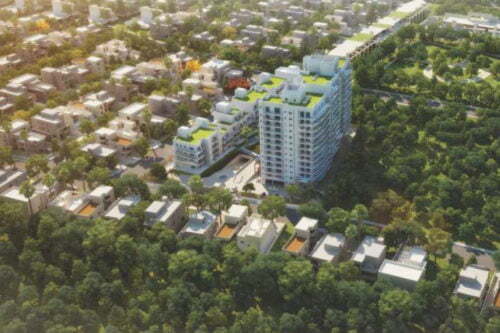 Centrally Air-conditioned Apartments / Town Houses of 5000 sq.ft./7000 sq.ft. Integrated complex – Apartments and Town Houses separated by Maintained Greens inside and surrounded by Jahanpanah Gardens, “W” Block MCD Park and the ‘M’ Block Market. Construction has commenced in KING’S COURT (Possession in 2 years). Close proximity to GK-II, M block market, for the ones who like to be amidst bustling city life. Apartment Type A01 ( 2nd Floor to 8th Floor) | 5442 Sq. Ft. Apartment Type A02 ( 2nd Floor to 8th Floor) | 5422 Sq. Ft. Apartment Type B & LIG Unit ( 2nd Floor to 8th Floor) | 7251 Sq. Ft.
Town House Layout Plan – 6976 Sq. Ft. 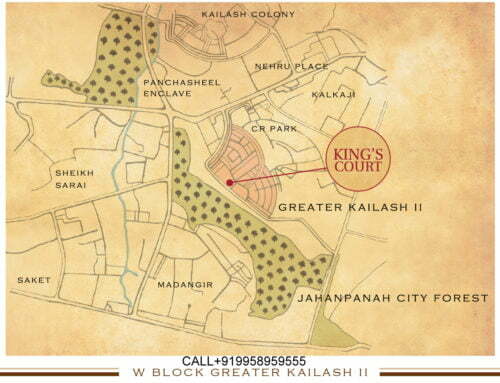 Details of “King’s Court”, Our Limited Edition Homes in GK-II are as under. DLF King’s Court- the most iconic property this city has ever seen. A legacy in luxury is born in the heart of New Delhi, GK-II. A rare collection of uber indulgent homes encrusted with the best that money can buy and subtle elegance that money just can’t. So much more than the most luxurious builders flats. Flats of app 5500/9000 Sq Ft on one land are unprecedented in Delhi with concierge services. King’s Court is as exclusive as it gets. Needless to say, these are for the ‘Limited few’. Attached floor plans can be modified as per area revision. Surrounded by “W” Block MCD Park and the ‘M’ Block Market. Please find attached the tentative layouts and below mentioned is the latest availability. Only few properties available for Sale and more so on the opportunity to be part of Exclusive Address.